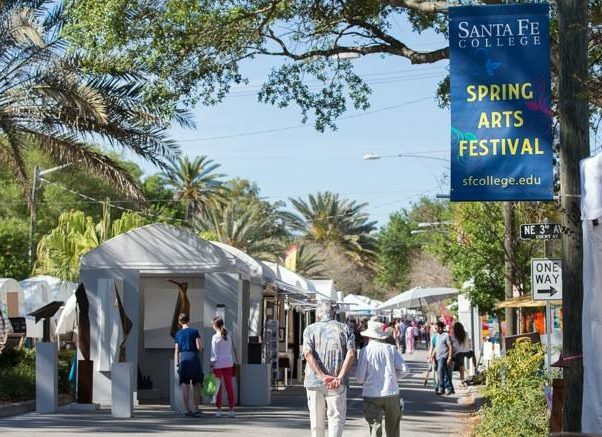 The 49th annual Santa Fe College Spring Arts Festival takes place this weekend along historic Northeast 1st Street. Local artist Mike Segal captures some of that history in this year’s poster art. This year’s Spring Arts Festival poster art created by Mike Segal. When Mike Segal was asked to paint the poster art for this year’s Santa Fe College Spring Arts Festival, he did some research on Gainesville’s history and came to a conclusion. 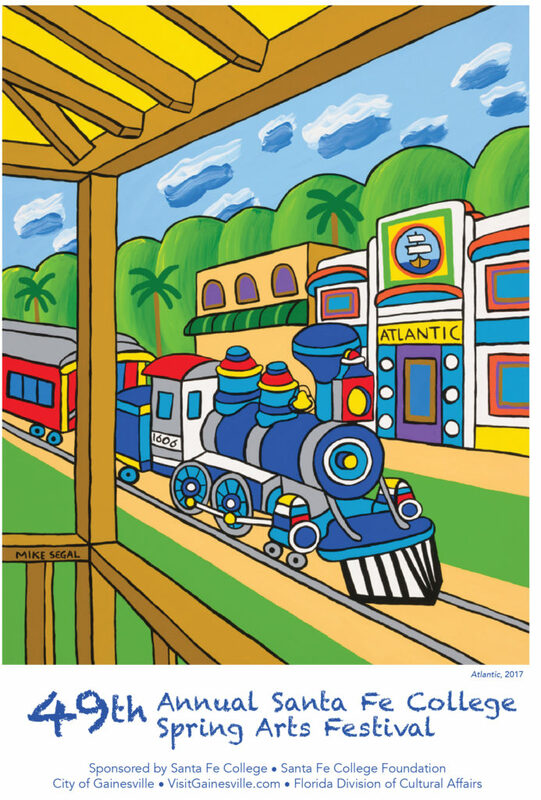 Using that knowledge, Segal went about painting a vibrant image of an old-fashioned locomotive pulling a train car down Main Street, past a downtown building that is now the Atlantic Nightspot. The painting will adorn posters and T-shirts available for sale Saturday and Sunday, when the 49th annual arts festival takes over tree-shaded Northeast 1st Street between 2nd and 8th Avenues. About 220 regional and national artists representing all mediums will be participating in the show, which will also include ongoing live entertainment on two stages and numerous food vendors. One change is the addition of the Actors’ Warehouse, 619 NE 1st St., as an entertainment stage, along with Bo Diddley Plaza. Unlike past years, there will be no music stage located at the Historic Thomas Center. The young artists’ and children’s creative areas are also moving from the grounds of the Thomas Center and will be situated north of the community artists’ area, on Northeast 1st Street closest to 8th Avenue. Northeast 1st Street is lined with artists’ booths during the 2017 Spring Arts Festival. Festival hours are Saturday 9 a.m.-5:30 p.m. and Sunday noon-5 p.m. In addition, there will be a Saturday night concert at Bo Diddley Plaza featuring local band GrüvTherapy at 6 p.m. followed by headlining guitarist Taylor Roberts at 7:30. All events are free and open to the public. Segal, the poster artist, is a self-professed history buff who has done an estimated 3,000 paintings in his career. He and his wife of 48 years, Marvi, live in the wilderness of Levy County, between Chiefland and Cedar Key. His studio looks out into an oak forest. The solitude serves as his inspiration. For the Spring Arts Festival poster, Segal chose an image of the type of old train — complete with a cowcatcher — that might have carried passengers and goods to Gainesville in the 1850s, long before the town became an education hub. The painting is rendered in Segal’s signature flat style with vivid primary colors and bright greens. The locomotive is emblazoned with the number 1606. That represents the year when the Santa Fe de Toloca mission was established along the historic Apalachee “royal road” used by Spanish missionaries traveling between St. Augustine and Tallahassee. Segal’s train is going down Main Street, where the old railroad tracks once bisected the downtown area. The building now housing the Atlantic Nightspot was originally the ticket office for the Atlantic Coast Line Railroad and later the First National Bank. Segal, a Miami native, studied landscape architecture at North Carolina State, a school that was influenced by people who designed the Blue Ridge Parkway. He started out doing flat designs on silkscreen for textiles. His first artwork was silkscreen on paper. “People didn’t value that medium, and I realized I could paint the same flat designs and make 10 times more money!” he said. During those formative years, Segal often traveled to Florida to sell his plein air paintings at various art shows. He moved to the High Springs area in 1989 and then to rural Levy County four years later to be closer to Cedar Key. Segal is a member of the Gainesville Fine Arts Association (GFAA). Two years ago, he created the poster for the 9th annual GFAA Fine Arts Fair at Tioga. That poster also depicted a vintage train engine passing the old Alachua County Courthouse. 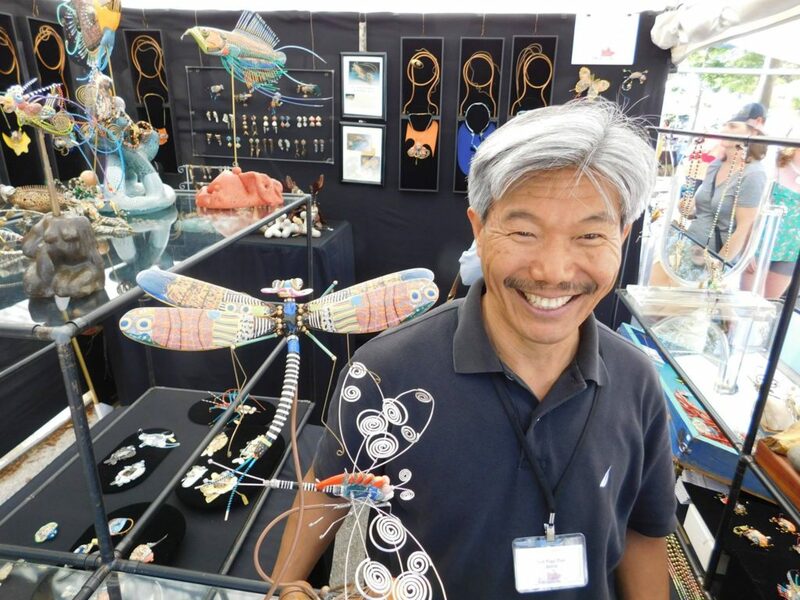 Erh-Ping Tsai, a New York-based jeweler, shows off his dragonfly that was used as the poster art for the 48th annual Santa Fe College Spring Arts Festival. He returns this year. “I want my work to be uplifting, to be an escape, to make people feel good and be happy,” he said. Segal’s distinctive “outsider” artwork has also has adorned posters for Gainesville Downtown Festival & Art Show as well as shows in Micanopy, Thornebrook Village, New Smyrna Beach, Ginnie Springs, Cedar Key and Dahlonega, Ga. 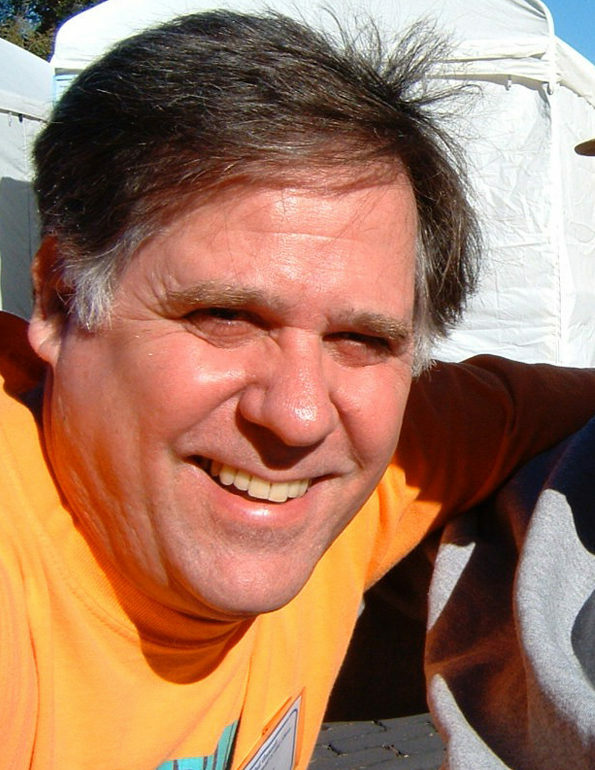 Although Segal has participated in the Santa Fe College Spring Arts Festival three previous times, this will mark his first appearance in 20 years. However, he has participated in shows in North Central Florida continuously for three decades. Artists compete for acceptance into the festival, where they may win prizes for outstanding creations and receive purchase awards from local collectors.